Need a quick overnight hill country getaway? 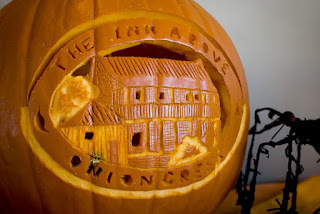 We still have a couple of rooms open for Halloween eve at the Inn Above Onion Creek. Special last minute rates available. Give us a call and we'll S C A R E you with our crazy rates! And remember guests will be judging our annual pumpkin craving contest. Don, the assistant innkeeper has his ready to go. Here it is.